Silver prices spiked some 2%, or $0.51, to $20.49 an ounce intraday Thursday before closing the session up $0.37 to $20.14 an ounce. The gains came as the U.S. stock markets sold off sharply. Stocks sank even after the Labor Department reported U.S. weekly jobless claims dropped to a seven-year low, a sign of ongoing recovery in the labor market and the economy. It was an agonizing day for stocks across all sectors. The Dow Jones Industrial Average tumbled 1.62% to 16,170.54. The S&P 500 Index slumped 2.09% to 1,883.11. The tech-heavy Nasdaq plunged a painful 3.19% to 4,054.11. The risk-off trade had investors seeking shelter in safe-haven silver. Also attracting precious metal investors to silver were mounting concerns over escalating tensions between Russia and Ukraine. The situation in the region is growing more heated as pro-Russian demonstrators in Ukraine have recently become more active. Thursday, NATO's secretary general called on Russia to pull its troops from the Ukraine border and stop instigating trouble. Conditions could quickly flare up at any moment, and the area is once again a geopolitical hotspot. Additional unrest in the area will likely stoke silver demand further. Also fueling silver prices is a more dovish-like sentiment from the U.S. Federal Reserve. Wednesday's release of the minutes from the March Federal Open Market Committee (FOMC) meeting indicates several Fed members said projections for an interest rate increase sooner rather than later might be overstated. Chair Janet Yellen said on March 20 that rates might start to rise about six months after the central bank ends its monthly assets purchases. 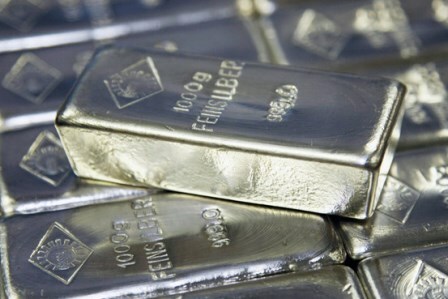 Silver prices fell 1.9% following Yellen's comments, as rising interest rates tend to draw investors away from silver. The March minutes, however, played down the remark. Perception of a prolonged low interest rate environment took the dollar lower Thursday. A weaker greenback typically boosts silver. The U.S. Mint reached milestone after milestone last year as strong American Eagle Silver coin sales hit records on numerous occasions. While 2014 hasn't been as momentous, March was indeed a good month for the Mint. Sales of American Silver Eagles totaled 5,354,000 last month, up 30% from February and up 59.5% year over year. It marked the Mint's fourth-biggest sales month ever. The March tally bought Q1 2014 sales of the coins to a whopping 13,879,000. The only time sales during the same three-month period have been better were in record-breaking 2013. Sales would likely have been even higher if the Mint hadn't been forced to ration sales due to its "inability to source sufficient precious metals blanks." Safe-haven seekers, savvy investors, and bargain hunters understand silver's worth goes sufficiently further than just an investment. It's an attractive alternative asset with real, tangible value. Silver prices will only run higher as investing in and demand for the white metal continues to grow. Read why Money Morning Resource Specialist Peter Krauth believes silver could stage another 1,000% run here.